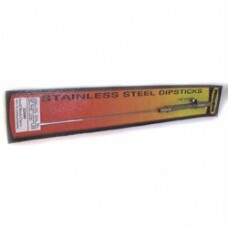 Milodon’s stainless steel dipstick assemblies have a unique sleek design as well as many functional benefits. CNC machined from billet stainless to stay bright and rust free even with use in an everyday driver. O-ring top seal for leak free operation and protection from water and dirt and efficient seal for racecars running an internal vacuum pump or vac-u-pan system. Designed for SBC up to 1979 – dipstick mounted up by cylinder head.